There is now an incredible opportunity for volunteers to live and work on a real-life African wildlife reserve. Covering some 15,000 hectares of land, the Legodimo reserve sits right on the border of South Africa and Botswana, straddling the majestic Limpopo River. On any average day on this unique project volunteers are likely to see Lions, Leopards, Elephants and Zebras, and volunteers have recently completed constructing a large watering hole, which has brought the action even closer to the camp! Projects Abroad, a UK voluntary company, manage this conservation and environment project in Botswana and South Africa. Gerrit Prinsloo, Head of Conservation for Projects Abroad, grew up in South Africa but can speak fluent Tswana, the national language of Botswana. 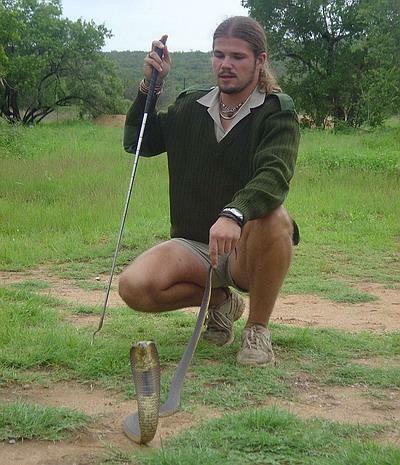 He has an extensive knowledge of all aspects of the Botswana Bush but his real passion is snakes. In fact he is one of the few people to have been bitten by a black mamba and survived! Volunteers describe him as eccentric, focused, and happy to leave society behind for his one true love. For further details please look at our website www.volunteer-conservation-south-africa.org. Set up in 1992, Projects Abroad specialises in offering students and others a diverse range of projects and destinations throughout Asia, Africa, Eastern Europe and Latin America. Projects Abroad offers 80 different placements to 3,500 volunteers per year in areas such as sport, medicine, teaching, conservation, journalism, care, business and community development. Photograph within release shows Gerrit Prinsloo on site of the Legodimo reserve. Additional photographs and interviews with Gerrit, Harry and other Projects Abroad volunteers are available upon request. For further information about this and other projects visit www.projects-abroad.co.uk.